There are several cascades on Eastern Stream, a creek that squeezes out atop the southern summit of Little Pinnacle Mountain in Jones Gap State Park. 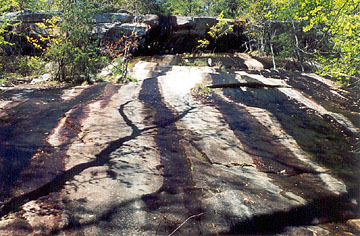 Near the top, Eastern Stream flows across a steep rock face to form a cataract bog. 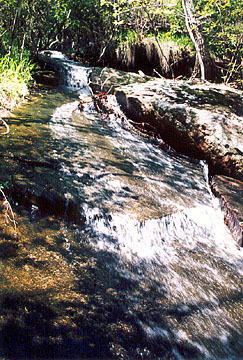 A cataract bog can form when a stream flows over sloped rock outcrop to produce a waterslide. The waterslide is not so steep as to wash away all the soil. Instead, it keeps the edges wet enough for habitation for rare plant species. However, the only way to reach this unique habitat is to hike up a (mostly) very steep 2.5 miles on the Pinnacle Pass Trail (#20 - orange blaze). Before hiking, stop in at Caesars Head or Jones Gap to register as there is no trail register box on Oil Camp Creek Road. While you are at the park, purchase a trail map and check on trail conditions. Purchase a copy of the "Mountain Bridge Trails" guidebook to get more-detailed descriptions of the 50-mile trail network in the Mountain Bridge Wilderness. The Pinnacle Pass trail is the longest trail in the Mountain Bridge Wilderness at 10 miles. Its ends can be accessed near Caesars Head and near Jones Gap. It can also be accessed via Oil Camp Creek Road. After driving to where Oil Camp Creek Road ends, hike up the road (upstream on Oil Camp Creek) to where it joins the Pinnacle Pass Trail. Listen for Oil Camp Creek Falls (not pictured) to your right. Turn right on the trail and go up and up and up and up. 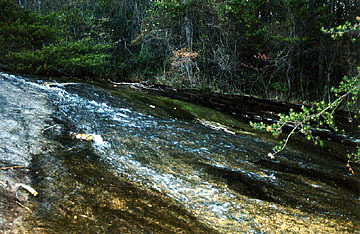 After 1.1 miles, you will cross Eastern Stream at the base of Eastern Stream Falls. Use the cable to prevent a fall. After 1.3 miles, cross a tributary of Eastern Stream with a small cascade. After 2-plus miles, cross a rock outcrop with views of Green and Campbell mountains just to the south across Oil Camp Creek Valley and distant views of Paris Mountain and the city of Greenville. Continue walking across the outcrop until you reach the cataract bog. Do not attempt to walk across the waterslide. The constant washing effect of the water has made the rock extremely slick. Help is a far, far away if you get injured. Directions: From Greenville/Travelers Rest, drive north on US 276 to its junction with SC 11. Continue on US 276/SC 11 for 1.5 miles and turn right onto River Falls Road (look for the F-Mart store and signs directing you to Jones Gap State Park at the intersection). Drive about 3 miles to Oil Camp Creek Road. Turn left and drive 2 miles to the gravel parking area at the gate. Do not block access to Oil Camp Creek Road.